New Mum Online: Do I Have What It Takes to be a Pro Blogger? Do I Have What It Takes to be a Pro Blogger? I've been blogging for many years, even before this blog. I even had a You Tube channel years ago before my current one. But I was always a hobby blogger and really for all intensive purposes still am. You see when people started to ask for guest posts when they'd go on holiday, to keep their blog ticking away in their absence, I used to laugh (inwardly only) as I couldn't see the point in it. It was my blog with my words and my photos. A week or two off never used to effect my stats, in fact sometimes they'd improve, oddly enough, and I am not the first person to ever notice that odd occurrence. Anyhow, the other thing that used to make me laugh was when people would post a pic of themselves in the garden or in Costa Coffee and say they were "working" - in my head I would always say "you're not working you fool you're blogging". When people started to do automated tweets and schedule nearly everything I was like "yawn"... "I'm keeping it real, when I am online I am ON LINE". When people started posting amazing photographs I was like "mine are fine, I am capturing their smiles and our moments not entering a photography competition". When YouTube started to take off, I was always tomorrow, tomorrow. "When I look good I will vlog more. When I have my hair done I will vlog more. When the house is tidy I will vlog more"
When Instagram started to take off, I was still sailing along just posting diary style photos of my kids. Still am really. When people started to network with PRs I still classed their emails as an interruption. Us old bloggers all (well maybe not ALL but it felt like it) used to once upon a time. As much as I hate the phrase: "back in the day". I didn't have a role model back then as anyone I saw reviewing something, I'd find it had a really low value and as I was still working, and could afford to buy those things, I was often of the view "WHAT is the point! I'm not giving up space on my blog for THAT!" i.e. a dummy worth £5 or a pair of gloves worth £12. I preferred to be authentic and give mention to things I truly loved with my own words and no pressure. I was even known to say "I am never ever doing a competition on my blog" and I made a huge U turn on THAT years ago. I've run some lovely comps that have been very successful. When people started to join Facebook blogging groups I was still of the age that Facebook was strictly for friends and family only. I was a kind of purist blogger that only used my blog as a diary and to keep in touch with a small group of like-minded online friends. But fast forward a few years and I often say "I missed the wave!" when hobby blogging turned into pro blogging. I actually missed it quite literally as my back was turned as I've hardly blogged at all since 2014. My hay day was the 2 years before. But really....... really I didn't miss it at all. The early days that resulted in the fruition of commercial blogging as we see it today began with those early adopters who were "working". While I was busy laughing that it was only a hobby, they were in fact busy working. I used to work 14-16 hour days (for the man... you know HMRC or whoever the "man" is these days) and blogging was too fun to ever be considered work by yours truly. Yeah when I got made redundant in 2012 I blogged harder but I didn't blog smarter. Skip forward to 2014 and I felt I'd already proved myself in the blogging world and felt free to get busy living, whilst others got busy blogging. I literally didn't notice the point when blogging went from GEEKY to TRENDY. Now the world and his wife has got a blog or at the very least an Instagram account. Now all of this would be absolutely FINE if I had no regrets but daily I am plagued with "what ifs" but every now and again I look at my plant on the kitchen windowsill and I remind myself that that is me. Down but not out. And it's quite appropriate as it is a succulent and they're just the thing in the online world currently. Ha ha! But not cacti, don't make me do cacti I hate the bloody things. 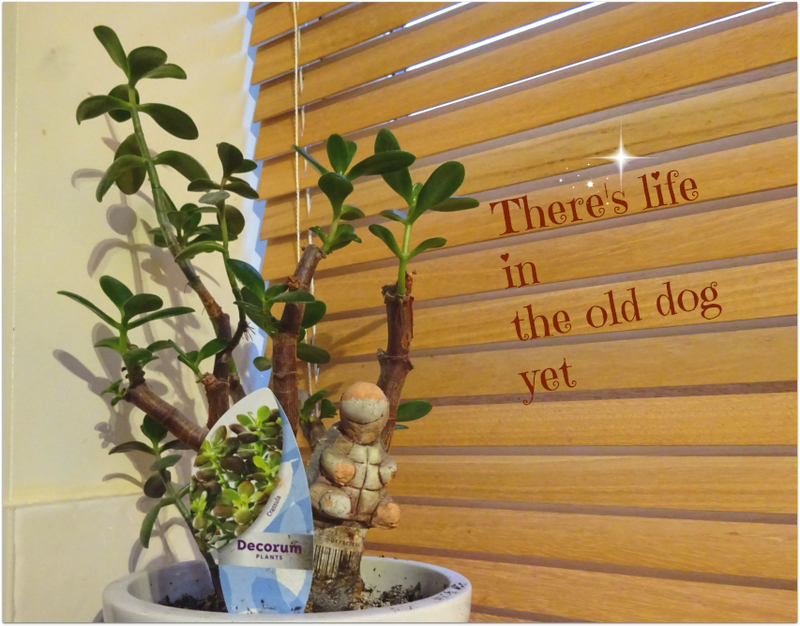 You see the thing about my Money Plant on the kitchen windowsill is it has died twice. The first time I put it in new soil and a new pot and boom it was GLORIOUS. The second time, I had moved it to the top of the filing cabinet in the sitting room and promptly forgot about it and never ever watered it. Last Summer the hubby bought two moss liners for hanging baskets and left them in the kitchen. By this time I had a new Money Plant on the kitchen window (it was a gift) which means I was being very unfaithful to my one true love (renegated to the sitting room). Anyway turns out that there must have been eggs on the moss liners as withing a few days my kitchen was filled with what I thought were fruit flies (they were actually fungal gnats) and whatever it was they did to my money plant it ended up in the bin. A while later I was clearing clutter on the top of my filing cabinet and came across the original and the best except it was dead dead deadski! What I learned a LONG TIME AGO at a Tony Robbins Unleash The Power Within event is that when we are not motivated to do something, often what does make us take the leap is doing something for others. And that my dear readers is where I am at now. I want my blog to be successful for my children. I want Lottie to be able to review things I can't afford to buy her. It kills me that I'm not in a position to review a SmarTrike - I haven't even got the guts to pitch for one. I don't feel my blog is currently sufficiently regular or out there. Plus I am behind on other things I need to review. I'd also love to buy or review a Cozy Coupe Little Tikes Car and wrote this post about an evening in the park with a heavy heart. I want to get a successful enough YouTube account that I don't have to go back to work. I am happy being a stay at home Mum at the moment and I want to be here to do the school runs. Being at home with Lottie at an age at which Aaron didn't get to fully enjoy me means the world to me. I went back to work when he was only 10 months old and although it was 3 days a week I was glued to my BlackBerry on all of the other days. I was a very busy HR Manager in a demanding role. Oh the irony. I'd even cancel swimming if I had to reply to an email or do work relating to one, even if it was my day off. I was SUCH a workaholic. I'm not saying I should now go to that extreme with my blog but I certainly need to do SOMETHING. I didn't go back to work when Aaron was school age as I knew I wanted to try for a baby and then I didn't as I was pregnant and then I didn't as Lottie was newborn but ALL of those excuses are now expired. And now it is time. Time to make money. Time to start pulling my weight in this household of ours. Time to take some pressure off the husband. Time for me to show my son what I can do. Time to work as hard as my peers. How apt therefore that the plant I am using to illustrate all of this is a MONEY PLANT. But it truly was DEAD. And I feel like my online presence is more or less DEAD, so I need to now focus on what I can do to give myself new soil and a bit of a lift, even if it is a facelift. When I was working for the man I was very ambitious and hard working and dare I say competitive. No email would go left unanswered whereas in the blogging world they all too often do. When I worked in an office I was the super user for Excel and was the go to person for any questions yet I have never done a spreadsheet for blogging in my life. I am that person who goes through the whole of Pay Pal when it's time to do the annual tax return. Even then it is a paper exercise as I never owe them anything. So it's now time to see what I can do as otherwise I'll be looking for a loan LOL. Thanks be to God I have made a lot of sacrifices so that I can afford (just about) to be at home. I hate asking the hubby for money so waxes, manicures and haircuts did a disappearing act a very long time ago. Luckily my hair is peppered with the odd grey hair and is au natural so I don't have the expense of hair colour. I don't run a car - I only had some lessons way back in 1998 and usually walk everywhere so as to save on bus fare. I often walk up to 30 miles a week. If I did decide to drive (or rather finish my lessons and pass my test) I'd have to go here to be able to afford it. Even though I'm not posh with interiors or my appearance I just know I couldn't drive around an unreliable banger of a car. It'd have to be new or nearly new and therefore more than likely on finance. I was always FIERCELY financially independent putting myself through University etc... so that's the only thing that's troublesome about being a stay at home Mum (SAHM) ... the money side of things.